"Many of you know, as Garden Alumni Webmaster, I started compiling this Fallen Dragons list several years ago. The list was kept current up thru 2008. After that, and due to health and personal reasons, I was unable to keep updates current. And, many of you have asked to keep these obituaries on the website since it is part of our history. This list covers obituaries 2002 thru 2008, based on the Garden High Facebook page and what folks send me by email. It is fixed and I will not add any more Alumni obituaries. Also, relative to keeping future records of deceased ALUMNI, the Garden Day Data Base will be the only bases for documenting Fallen Dragons. This is another page on the website and it can be viewed by Clicking Here. Stay safe, be healthy, be happy, keep the Dragon Spirit alive, and take care. RAPPS MILL, VA. Kermit T. Wooldridge, Sr., 75, died Wednesday, April 16, 2008 in Roanoke Carilion Hospital. MORE..
ABINGDON, VA. B. T. QUILLEN, Principal of GHS from 1942 to 1972, died peacefully at his home on Wednesday, May 30, 2007. He was 102. ....MORE. OAKWOOD, VA. Wallace Blankenship, Class of 1948, passed away in May 2007. MAVISDALE, VA. Gladys Ruby Keene Reed, 84, passed way at her home on May 7, 2007. .....MORE. REYNOLDSBURG, OH. Samdra Simpson Berry, Class of '61. Email from Ross Simpson: "On 2-14-2007, my sister Sandra Simpson Berry, Class of 61 lost her battle with cancer. She passed at 4:20 AM." CLASS OF '64 - Email from Jo Anne Blankenship Bryam'64: "From my class of 1964, the fallen dragons are J. K. Ratliff, Wayne Mitchell, Ella Dean Ball, Harlis Powers, Ronny Estep and Carl Blankenship. To my knowledge, this is all. To the class of 1968 I would like to add my own brother, Gary Wayne Blankenship. He died in Oct. of 1999 from a brain tumor." MORE about Gary'68. WELLSTON, OH - GANE HALE, GHS CLASS OF '48, passed away on 23 November, 2005. LIST OF FALLEN DRAGONS FOR CLASS OF '55 - List provided by Ethyl Smith'58 on 30 October 2005: 1. Alma Welch d/Sept 24, 2004;2. Edna Street d/ June 21, 2004; 3. Geylean Addison d/March 08, 1993; 4. Paul Bartrum d/March 08, 1995; 5. Bobby Cook d/early 1966; 6. Ira Ratliff d/Feb 05, 2002; 7. Ruby Matney d/July 30, 1996; and; 8. George Smith d/June 20, 1997. OAKWOOD,VA - WOODROW W. MCGLOTHLIN, age 91, passed away on Thursday, Sept. 15, 2005. MORE..... Also, words from Woodrow in a 2000 article. WARRINGTON, VA - CLAUDE THOMAS MABE, age 63, passed away on Thursday, May 12, 2005. MORE..
ROWE, VA - LORETTA BYRD MCGLOTHLIN. Loretta, Class of '54, died on 15 January 2005. "My wife's brother, Sonny Mabe passed away last night on 9 October about 11:15 PM from complication of health problems at St. Mary's Hospital in Richmond. He was in the Garden High School Class of 53.Viewing is from 7 PM to 9 PM Monday evening at the J. T. Morris Funeral Home at 3050 W. Hundred Road (Route 10) in Chester (23831) and the phone number is 804-748-2500. Funeral services will be at the Funeral Home on Tuesday at 4 PM." COLUMBIA, SC - Tommy Joe Owens, 60, of Abingdon, formerly of Buchanan County, Va., passed away Monday morning, Feb. 2, 2004 at the Veterans Hospital in Charleston, S.C. following a short illness. He was a '62 graduate of Garden High School and beloved by everyone. 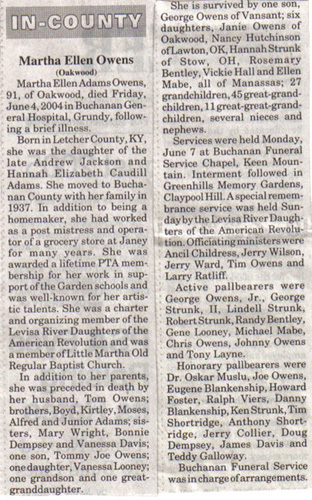 Click for re-print from Bluefield Daily Telegraph, Feb 5, 2004. OAKWOOD, VA - Sally Ann (Cook) McGlothlin, 88, of Oakwood, the beloved wife of Woodrow W. McGlothlin, departed this life to be with her Savior on Sunday, Jan. 26, 2003, at Buchanan General Hospital in Grundy. She was a graduate of Triangular Mountain Institute (TMI) and a 1936 graduate of Radford College. She was an elementary school teacher in the Buchanan County School System for several years, having taught at Street School, Vance School, and Garden Elementary School. She and her husband were married for more than 63 years and she was a member of the Garden United Methodist Church for more than 65 years. Click for re-print from Bluefield Daily Telegraph, Jan 29, 2003.
at his daughter's home in Manassas, Va. following a long illness. Born at Crane's Nest in Dickenson County, he was the son of the late George Monroe and Victoria Large Owens. Click for re-print from Bluefield Daily Telegraph, Oct 20, 2002. VA. and Maryland, passed away Thursday, Oct. 17, 2002 at his home following a brief illness. Born in Buchanan County, he was the son of the late Charles G. and Charlotte Keen Addison and husband of Katherine Sue Wade Addison, GHS Class of '60. Click for re-print from Bluefield Daily Telegraph, Oct 19, 2002. CLASS OF '47. Stanford J. Mullins, Jr. died 1991. CLASS OF '53. To the best of our knowledge, the deceased members of the '53 class includes Ana Jean Buckles (passed away on September 22, 2003). CLASS OF '52. To the best of our knowledge, the deceased members of the '52 class includes Curtis Wade, Kilgore Edwards, Grady Hess, and Mary Simpson. CLASS OF '68. Email from Michael Simpson'68 in Sep 2005 provide the following data: "There are 4 fallen dragons from the 68 class that I know about Garry Huston Keen in 1969 ( son of Marvin Keen ); Jessie Phillips in 1972 ( son of Bill Phillips ); Eugene Hess in 2003 ( son of Beacher Hess);and, Larry Hughes in 1977. Larry died from contact with agent orange in Viet Nam."